Today we can see a truly global marketplace. 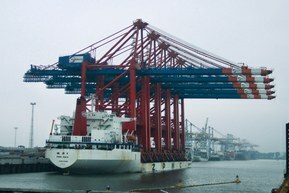 The global exchange of goods requires efficient logistics systems. Cables and their corresponding accessories play an important role in this. Every link in the process chain must operate reliably as the weakest link determines the reliability of the whole system. Whilst globalisation brings the world closer together, global trade flows continue to grow steadily. This development is being made possible thanks to modern communication and transport systems. In global logistics, fast reaction and processing times depend on a high degree of flexibility. Handling processes must run smoothly and cost-effectively. For material handling applications, Lapp offers a comprehensive range of ÖLFLEX® connection and control cables, UNITRONIC® data lines and cable-related accessories. Our range of cables for lifting and handling equipment is designed to be used as hawsers, reel cables or as towing cables on lifting gear and transport/conveyor systems. We also supply lift/elevator cables for different installation lengths and flat cables, including for cable trailer systems. Naturally, Lapp also supplies preassembled system solutions. As a global player with a worldwide distribution network and international production sites, we can support your business all around the world. The quality of Lapp cables is regularly tested in our test centre and laboratory. For example, we perform endurance testing on a test bench especially designed for reeling cables such as ÖLFLEX® CRANE. Parameters such as reel speed and tensile load can be adjusted as required. We pay attention to quality so that you can count on our products. Can't find the correct product for your application? Our specialist staff supported by our testing centre can develop customer-specific solutions to meet your specifications. We can also provide on-site advice on specific applications.